Russia has started decorating its New Year’s trees. Last year, imports of decorations rose by a quarter, and new records are expected this year. According to “Guinness World Records,” the most expensive Christmas tree bauble in the world was made by the specialist shop Hallmark Jewelers in 2009. The white-gold sphere was encrusted with 1,500 diamonds and 188 rubies and surrounded by two gold rings; it was valued at 82,000 pounds ($132,225) by the UK’s National Association of Goldsmiths. The most expensively decorated Christmas tree was the work of the Japanese branch of Piaget, which adorned a tree with 83 jewelry decorations worth $16 million. 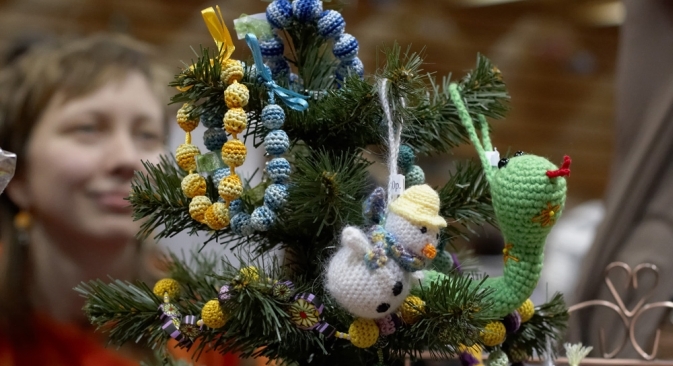 In Russia, where the average cost of one bauble varies between 60 cents and $1.30, people prefer to dress their trees in plastic and acrylic decorations; the most popular suppliers are still China and Ukraine. Timur Kazantsev, director of the research company AS Marketing, says that China accounts for almost 86 percent of the total imports of tree decorations. Ukrainian suppliers have a share of just 5 percent. The rest is divided between manufacturers in 30 different countries, including Thailand, Vietnam and Poland. According to AS Marketing’s data, the total amount of goods sold for the New Year and Christmas holidays in 2011 came to $78.67 million and weighed in at 17,500 tons. This represents a rise of 26 percent against 2010, both in real terms and by cost. At the same time, Kazantsev notes, the Russian market beat the pre-crisis level of 2008 by 12 percent in real terms and by 27 percent in terms of cost — and there is every chance of this trend continuing. The main advantage of the Chinese manufacturers is price, says Natalya Kucheryavenko, head of sales at the Rozhdestvenskaya Yarmarka (“Christmas Fair”) online shop. “One of our suppliers imported a toy from China that was made in Russian designs. If it had been produced in Russia, it would have cost 520 rubles, but with a label saying ‘Made in China,’ it costs just 190,” said Kucheryavenko. The reason for this is more expensive labor and taxes, she estimates. The other driver of Chinese trade is the country’s competitive production costs. There are about 750 export firms working in the city of Yiwu (the main producer of New Year’s merchandise), but Russia has only four major producers. It is no surprise that the ratio of Russian-made products to imported goods is 10-to-90. The market for tree decorations in Russia is modest and still fairly conservative. In many regions, the standard of living does not allow people to spend money on New Year’s decorations: in these places, the cheapest baubles are used, costing 15-20 rubles (50-65 cents) each. Furthermore, the Soviet tradition of putting old decorations on the tree is still alive and well, and it does not exactly help to develop fresh New Year’s fashions. In other words, people simply do not realize that the tree can be decorated in any particular style. In this sense, Russia is very different from Europe, where 60 percent of decorations are bought for one season; the fashion tone is set for the whole year in January, at the prestigious Christmas World exhibition in Frankfurt. By comparison, the Russian equivalent, Christmas Time, takes place 100 days before New Year’s, and many of the goods exhibited there still seem like “haute couture” to the majority of Russians. Most ordinary people prefer to take their cue from the Chinese calendar when choosing their tree decorations. According to the organizers of Christmas Time, 2013 (the Chinese Year of the Black Water Snake) will make “aquatic merchandise” fashionable. The decorations most in vogue will be miniature sea creatures, and the dominant colors will be green and dark blue, combined with “snake” gold and silver, market experts predict.